This paper describes the request validation feature of ASP.NET where, by default, the application is prevented from processing unencoded HTML content submitted to the server. 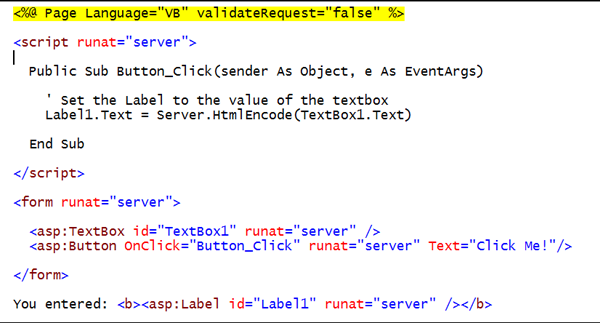 This request validation feature can be disabled when the application has been designed to safely process HTML data. Applies to ASP.NET 1.1 and ASP.NET 2.0. Request validation, a feature of ASP.NET since version 1.1, prevents the server from accepting content containing un-encoded HTML. This feature is designed to help prevent some script-injection attacks whereby client script code or HTML can be unknowingly submitted to a server, stored, and then presented to other users. We still strongly recommend that you validate all input data and HTML encode it when appropriate. For example, you create a Web page that requests a user's email address and then stores that email address in a database. If the user enters <SCRIPT>alert("hello from script")</SCRIPT> instead of a valid email address, when that data is presented, this script can be executed if the content was not properly encoded. The request validation feature of ASP.NET prevents this from happening. Many sites are not aware that they are open to simple script injection attacks. Whether the purpose of these attacks is to deface the site by displaying HTML, or to potentially execute client script to redirect the user to a hacker's site, script injection attacks are a problem that Web developers must contend with. Script injection attacks are a concern of all web developers, whether they are using ASP.NET, ASP, or other web development technologies. The ASP.NET request validation feature proactively prevents these attacks by not allowing unencoded HTML content to be processed by the server unless the developer decides to allow that content. 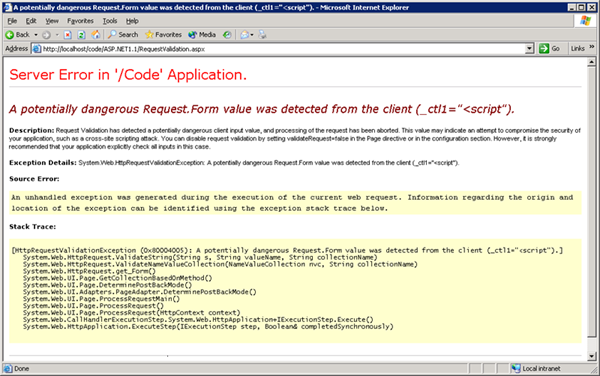 Request validation has detected a potentially dangerous client input value, and processing of the request has been aborted. This value may indicate an attempt to compromise the security of your application, such as a cross-site scripting attack. 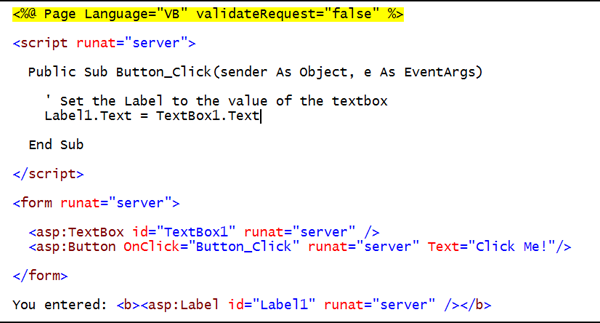 You can disable request validation by setting validateRequest=false in the Page directive or in the configuration section. However, it is strongly recommended that your application explicitly check all inputs in this case. When request validation is disabled, content can be submitted to a page; it is the responsibility of the page developer to ensure that content is properly encoded or processed. If you wish to disable request validation for all applications on your server, you can make this modification to your Machine.config file. When request validation is disabled, content can be submitted to your application; it is the responsibility of the application developer to ensure that content is properly encoded or processed. To prevent this from happening, with request validation turned off, we need to HTML encode the content. If you have disabled request validation, it is good practice to HTML-encode content that will be stored for future use. HTML encoding will automatically replace any ‘<' or ‘>' (together with several other symbols) with their corresponding HTML encoded representation. For example, ‘<' is replaced by ‘&lt;' and ‘>' is replaced by ‘&gt;'. Browsers use these special codes to display the ‘<' or ‘>' in the browser. 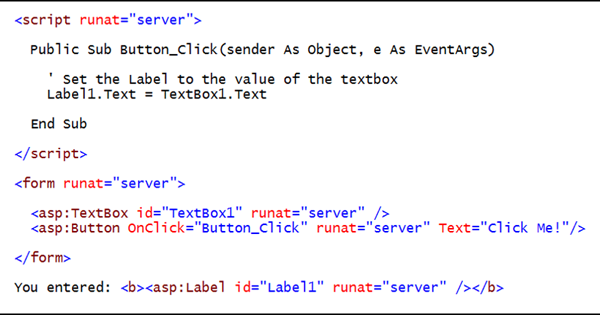 Content can be easily HTML-encoded on the server using the Server.HtmlEncode(string) API. Content can also be easily HTML-decoded, that is, reverted back to standard HTML using the Server.HtmlDecode(string) method.